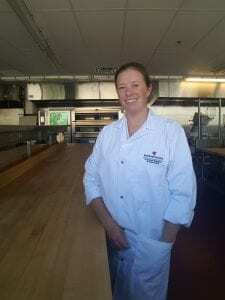 Bringing more than 10 years of experience in the agri-food industry, Heather Hill has joined Red River College’s Culinary Research and Innovation team for a six-month term as a Research Manager. Peas, beans, lentils and chickpeas – collectively termed pulses, are what Heather brings to the table in terms of expertise in food development research. She has worked in partnership with agri-food companies and organizations from Beijing, Switzerland, Morocco, Minneapolis, Steinbach and Portage la Prairie – from large multi-national corporations, to farmers looking to add more value to their crops, and everything in between. With a Master’s of Science degree in food science, and a background in value-added ingredient development, Heather brings a bold new perspective to the team. She loves being presented with a challenge and providing practical solutions to overcome an issue. In her new role here in Culinary Research and Innovation, Heather will be providing a science-based approach to help with the applied research activities of the department. Heather can be reached at hhill@rrc.ca. Q: Science and art seem to be on nearly opposite ends of the spectrum, how does science play a role in the culinary arts within Culinary Research and Innovation? Food is such a complex composite material. With many interactions and reactions taking place during processing it requires both art and science to truly understand how a food system will respond to treatments, while still being a high-quality product. I think the science component really helps to explain the ‘how’ and ‘why’ of food while the art piece brings out creativity, style, ingenuity and especially the deliciousness of food. Q: Food science is not an extremely known discipline here in Canada, what interested you about studying food? I love the universality of food; that it is something we all relate to, and that we can use as a starting point to get to know so much more about one another and our cultures. Food physically brings people together, it makes me smile to think of this as I’m working in food development. Q: Trends in food are constantly changing, what trends are currently catching your eyes, ears and taste buds? Coming from the plant protein world, I am always watching trends that incorporate plant and sustainable protein sources in product development applications. There is so much going on in this area, especially in Western Canada, and it will continue to boom. I’m looking forward to seeing the role Canada will play in plant protein technology and food development. I’m also very interested in seeing more recognition of traditional indigenous foods here in Manitoba. I think this has so much potential to improve food security of our Northern communities and build cultural bridges here, as well as to add greater diversity to our local food supply. Red River College is so well positioned to be a leader in this area, I think exciting things are in our future. With an 18 month toddler at home I am also always scanning for new ideas to feed my little one that are both tasty and nutritious. She is a tough critic and is constantly changing her list of preferred foods. Right now I’m trying out chia puddings… and spending a lot of time cleaning our floors where the rejects are landing. Q: What is your favourite thing to cook and eat and home? In the summer we spend a lot of time barbequing so we don’t heat up our house too much. We love to cook ribs, actually we have an annual rib competition with our family every November so we need to spend the summer perfecting our next award winning recipe! Q: What’s the most interesting dish you’ve made using pulses? I love to learn about different cultures and their traditional pulse dishes. I’ll research the recipe and history and give it a try in my kitchen. When I was last in Morocco I heard about a traditional chickpea cake they make called karane or kalinti, which is basically a chickpea-flour egg quiche. Every time I make it, it reminds me of the busy, colourful, sights and sounds of the medina of Fez. Q: What excites you about being a part of the Culinary Research and Innovation team? I’m really looking forward to being a part of the multi-disciplinary team here, not only with the blending of food science and culinary arts in Culinary Research and Innovation but also having the opportunity to work with other departments within the College. I don’t know where else you can find expertise in culinary arts, engineering, communication, design, life sciences and social sciences all in one setting!